In the aftermath of General Conference, all kinds of things are being said about the traditionalist coalition that voted down the One Church Plan favored by the bishops and progressives and secured the passage of the Traditional Plan. On the part of said bishops and progressives, much of what is being said is spiteful; some of it is condescending. Little attempt is made to understand who is on the opposite side or why they take the stands they do. Meanwhile, on the part of those who are heartened by the passage of the Traditional Plan, there is also some confusion. The various members of the coalition sometimes assume that everybody in said coalition is “people like us.” But that’s not really true, either. The traditionalists are a broad-based coalition who are particularly united on the presenting issues of doctrine and morality. They do not necessarily think alike on all things, nor do they always understand where their various partners are coming from. This series of blog posts is an attempt to explain the traditionalist coalition to both its opponents and its supporters. The opponents need to finally see who we are instead of assigning us an identity that fits their preferred narrative – see us as us, not just as the foil to you. And the supporters need to understand who their partners are, if this coalition is to continue to lead the church – to become a governing majority. 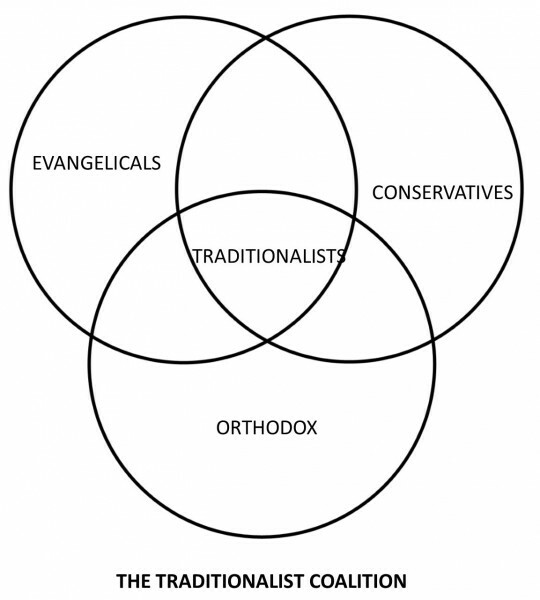 As I understand it (and all these thoughts are mine alone), the traditionalist coalition is made up of three overlapping constituencies: the Evangelicals, the Conservatives, and the Orthodox (see Venn diagram, below). Each has its own point of view, though on doctrine and morality all tend to agree. We will begin with the Evangelicals. The term evangelical has many meetings. In theology, it refers to the proclamation of the Gospel. It can be used as a shorthand expression for a church that is interested in evangelism, as when someone speaks of an “evangelical [form of] Catholicism.” In Europe (and among Lutherans worldwide), it means simply, “Protestant.” (The UMC in Germany and Switzerland is not called in German die vereinigt-methodistische Kirche, but rather die evangelisch-methodistiche Kirche -- the EmK.) These are all special meanings, and have little to do with how evangelical is used by the people who call themselves by that name that we are used to dealing with. Evangelical has two main meetings in American usage. First, it refers to a particular kind of theology, centering upon the Bible. One bishop this week referred to the traditionalists’ “simple understanding of the Bible.” It needs to be pointed out that what Evangelicals believe about the Bible and how they interpret it is anything but simple. They are highly sophisticated exegetes. Besides that, those who attend the best evangelical seminaries, like Asbury, are required to read the same texts that progressives read, in addition to texts by evangelical scholars. Others who attended liberal seminaries had to read liberal scholarship, of course, and yet are still unpersuaded. The point is, Evangelicals know their stuff, and they know progressives’ stuff, and they can defend their positions as well as critique the opposition. Progressives rarely read anything written by Evangelical scholars, and so consistently misunderstand their positions and attribute to them ideas and motives they do not hold. At any rate, Evangelicals believe that the Bible is the inspired Word of God and is fully reliable and authoritative in all that it teaches. Some believe in “inerrancy,” and some do not. “Inerrancy” is more a feature of Calvinist theology than our Arminian modes of interpretation, so Methodist Evangelicals vary in their interest in the idea; nevertheless, they will defend the integrity of the Bible. They believe that the Bible is clear on what it teaches, especially on the big ideas of sin and salvation. Evangelicals believe that the Bible is not just a mishmash of holy rules and stories; it is a narrative, and within that narrative there is development. Progressives who attempt to argue against evangelical ideas by selective quotation of the OT law ignore the development within the Scriptural accounts of that law, and how the apostles ultimately came to interpret it. In effect, the Evangelical view of Scripture is that the Bible is a self-authenticating text, that it is what it is because God has made it as it is. It is his gift to the Church in just that form. Of course, they are assuming a 66-book Bible, as we Protestants are used to seeing it. Most of them see the deutero-canonical books as things put in later without authority by the Catholic Church or something; yet these books were part of the Septuagint, which all the apostles used and quoted. They were not put in later; they are far older than the Church itself. By what authority then were they removed? When, exactly, did God give the Bible in just that form we have it today? This is a problem, but Evangelicals wave it away – as those who believe in inerrancy “in the original autographs” of Scripture wave away the problem that they are professing belief in things which are unrecoverable because they don’t actually exist any more. Well, let that go. However we got the Bible, there it is. For Evangelicals, the question is, Do you believe what it says, or not? God speaks to us through this book, and what he has said does not change. If we believe it, then we are bound, and there are things we cannot approve, not for any price, even to make someone else feel loved. The other main meaning of evangelical is as the name of a religious subculture. Evangelicals, as a group, like certain things, have certain customs, talk in a certain idiom, etc. These traits have little to do with the Bible or with theology. They are just the way people do business with each other. And people being what they are, we all are easier with, and put more trust in, those who are like us. So Evangelicals recognize each other and tend to cluster together and sometimes look suspiciously at those who don’t express themselves in the same way that they do. When political commentators talk about “the evangelical vote” or poll “evangelicals” about things, they are talking about the subculture, not theology. Evangelicals may, by and large, like country music, but that’s because of the milieu so many of them come from, not their view of Scripture or morality. And because “evangelical” can be merely a cultural tic, we find that among Evangelicals there are many things that appear that are also common in the culture at large, and which are not a very good witness. Evangelical divorce rates, for instance, are sometimes cited as belying the high view of marriage they profess from the Scriptures. The kind of patriotism current among Americans generally, especially those from certain parts of the country where Evangelicals are strong, sometimes comes out in Evangelicals’ backing of things that other Methodists see as jingoistic. And certainly, this subculture is not prevalent everywhere among people who agree with Evangelical theology. As African and Filipino and Central Asian delegates have assumed more importance in General Conference in recent years, it has become apparent that they are far more “evangelical” than the US church. But that doesn’t mean that they are culturally like American Evangelicals. We are talking about their view of the Bible and their teaching of doctrine and morality, not what kind of music they like or their political views. The oldest advocacy group among the traditionalist coalition is Good News. Founded in the late 1960s by Chuck Keysor of Illinois, it began as an attempt to articulate the theology of “Methodism’s Silent Majority.” Even then, the leaders of the church were out of touch with the bulk of its membership. Good News became a magazine. It spawned the Mission Society for United Methodists and various kindred renewal groups. The current president of Good News is Rob Renfroe of Texas. He is often the public face of the wider movement: first, because Good News has been doing this the longest and has the widest reach; and second, because he has a sober and friendly persona and the ability to break down complicated events and maneuvers in a way that ordinary people can follow.